I've made a couple of giveaway packets from the new product stash I received from Fire Mountain Gems and Beads last month, and here's the first that's up for grabs! Stay tuned...the next gift packet will be metal! One can never have too many beads. I would love to give these a new home. Please sing me in for a chance to win those pretty beads. Awesome beads! Pretty please count me in for your amazing giveaway! Thanks a bunch! I'd love to win these beads. Hi, my email is klcombs.mn@gmail.com. Bead giveaway! I have never heard of it. That is amazing. Thank you very much! Lovely beads and wonderful giveaway. Hi Cyndi, Thank you for the chance to win some beautiful beads. I like working with unusual materials and I have not tried the rubberized beads yet. I shared your great bead giveaway on twitter. I posted your bead giveaway on facebook. I have purchased many products for you and your tutorials have inspired me to go beyond my comfort zone and try new designs. Thank you. 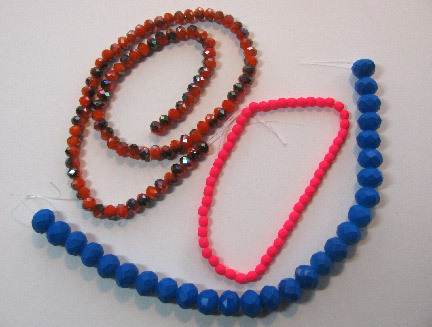 Would love to win these beads in order to make the crochet bracelet you talked about. Bead crochet yourself a happy bracelet!